Many of us who were born after the Baby Boomers into a middle-class western family have likely been told from a young age that we can be, and have, anything we want. These early impressions shape our expectations of the world and how to live and be in it. As per its name, this model implies a hierarchical scaffolding of needs: all lower order needs must be satisfied before a person becomes concerned with the higher order ones. Whilst very common and easy to understand, this model may not be entirely correct. 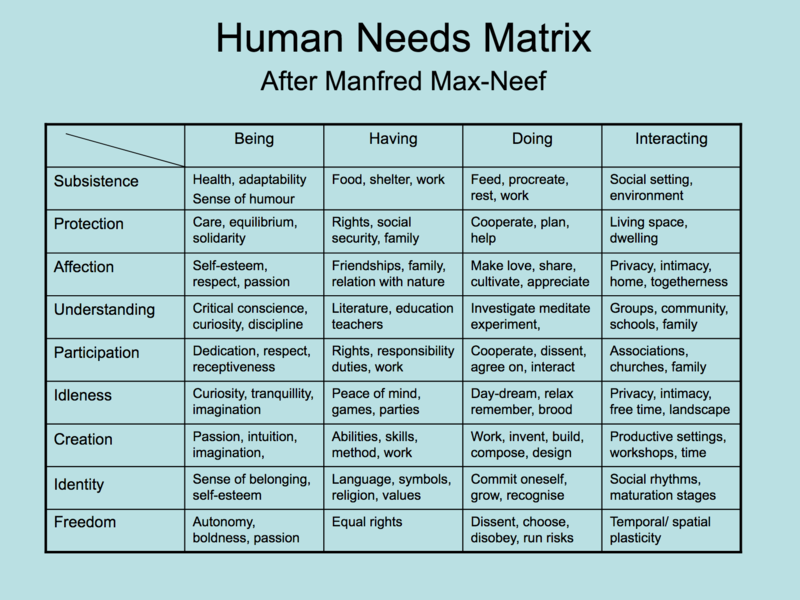 Max-Neef’s ‘Subsistence’ needs are similar to the ‘Physiological’ ones included in Maslow’s model, and you could consider them the more fundamental needs that a person must satisfy to continue living. As a radical simplification, one could argue that in order to live, all someone ‘really needs’ is subsistence. Things are not nearly that simple though. 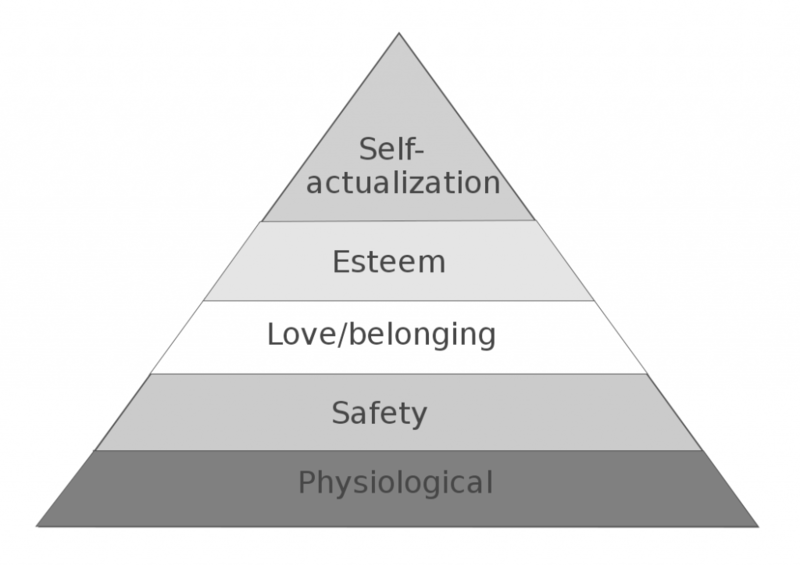 Take Maslow’s ‘Safety’ or Max-Neef’s ‘Protection’ for instance – we could also argue that they are more fundamental needs, too. Imagine a life where you have some shelter and just enough to eat but you are continuously being threatened or hunted; this would immediately strike us as inhumane. What we are particularly interested in here are the ‘needs’ at the opposite end of the spectrum from subsistence: the needs that are really ‘wants’ masquerading as needs. These are commonly created, or manufactured, by the marketing and advertising machine in service of the capitalist world system. Is it possible to identify these manufactured needs? Perhaps, but not with full accuracy, since needs are highly contextual. Let’s start with something seemingly easy. Does anyone really need a high-sugar carbonated soft drink? In most cases the answer is clearly no. Certainly in countries that have good availability of clean tap water, soft drinks are a completely discretionary lifestyle item that we are buying only because we have been taught to enjoy it. Now imagine a country or city that has no reliable water infrastructure, either permanently or temporarily. You could argue that in that scenario bottled soft drinks can be the safest option to drink, and therefore a true subsistence need. However, you can also argue that if a place has bottled soft drinks available it will likely have bottled water too; if so, the soft drink suddenly reverts back to a discretionary luxury ‘want’ rather than a true ‘need’. Wants and needs are highly contextual. 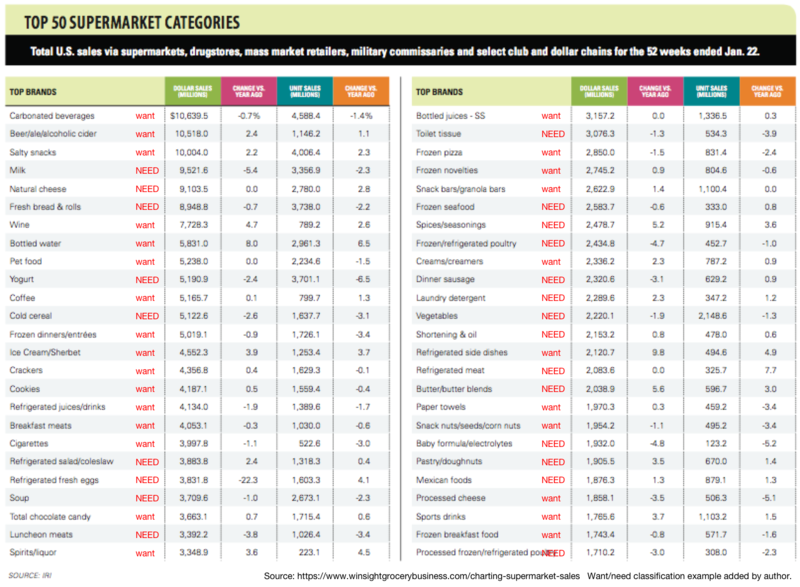 We can debate the specifics of the breakdown but I hope the main point is clear: a significant proportion of US supermarket purchases are made to satisfy wants, not fundamental needs. 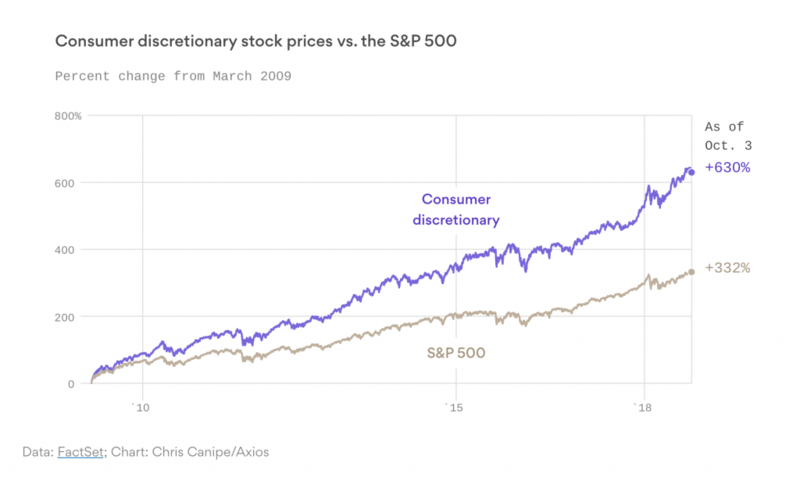 If you look at this from a purely economic perspective it is great: we have more consumers buying more stuff, which keeps the economy turning. 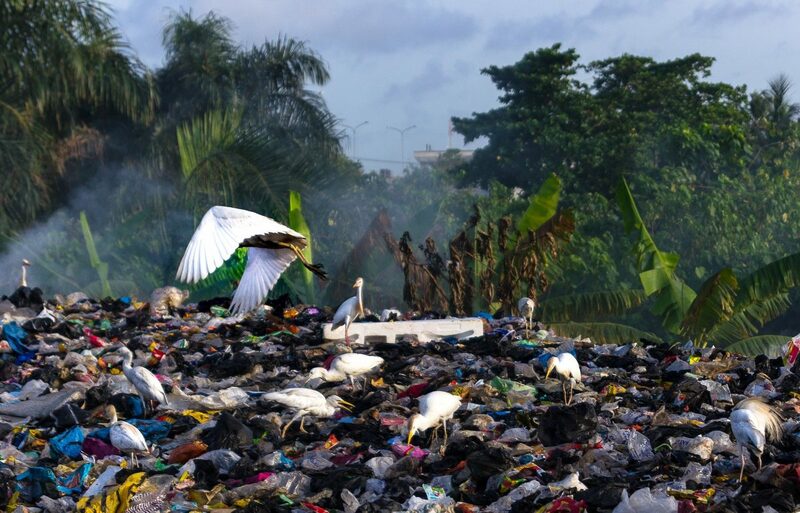 However, as soon as you consider the huge environmental costs and other externalities such as health impacts from products like alcohol, tobacco and highly processed food, the picture shifts. Major supermarket chains across the globe are peddling products that are fundamentally unsustainable, only because that is where a lot of the growth and profits are. Is driving a basic need? What about something like having a car: do you need one, or just want it? Again, the answer is not black and white. If you are lucky enough to afford living near good public transport or close enough to walk or ride to work, having a car is clearly a discretionary luxury – a want. However, if your livelihood directly depends on driving to or for work, a car suddenly becomes a need. You need an income to pay for your food and housing, and the job that gives you that income requires that you have a car. As with many other products, there is another dimension to consider, too: how ‘good’ a car do you ‘need’? If the core purpose of your car is to ferry you between home and work, as it is for most Australians, the cheapest possible car should satisfy this need. However, that is not what we buy: what we actually buy are cars that are much larger and much less economical, with much higher performance, compared to what would be enough to travel from one location to another. No longer a need, we are suddenly back at the ‘want’ end of the spectrum. However, if pressed, we weave very sophisticated stories to justify this purchasing behaviour to ourselves and to people around us. These better cars that we buy are newer, safer and more spacious, with better visibility, better entertainment for longer trips, and so forth. What is happening here? We have internalised the carefully crafted messages from the marketing and advertising machine, and fully believe that what we want, is what we really need. Again, in satisfying these ‘needs’, we satisfy our even-increasing demand for more comfort, more convenience and a higher standard of living. This may be fulfilling to us right now but it comes at a huge cost to planetary resources in manufacturing and running these enormous, complex vehicles: we are effectively stealing from the future. There are additional externalities, too: traffic fatalities, increased direct pollution of the air we breathe, congestion, a cycle of debt, lost time, kids learning that the only way to travel locally is by driving, and so forth. Housing is too complex a topic to be covered in detail but I will touch on it briefly. Shelter is a core human need, and in the modern western society we tend to satisfy this need either by renting or buying property. Our decision on where to live centres around cost, location, type and size of the dwelling, and these choices are full of trade-offs. A few things are clear though, at least amongst the middle class here in Australia: we generally consider it desirable to buy the property we live in, and we tend to prioritise size: although house sizes have been reducing slightly in the past 20 years, bigger is still better. If you live by yourself and could easily fit your life in a one-bedroom apartment but choose to live in a three-bedroom house, you’re satisfying your wants, not needs. We are obsessed with property in this country. Huge industries depend on it, and have created a system that transforms wants into needs extremely efficiently. We prefer single family houses and low density, which and turn fuels the urban sprawl and car dependency, both of which have significant negative impacts on the environment and our health. There is one other aspect of the Australian housing system worth mentioning, which is the financialisation of real estate. Unlike several decades ago, a house is no longer primarily a home but an asset and an investment. Australians now talk about investment properties, loan-to-value ratios, yields, renovations and subdivisions as if all that was normal; it is not. Turning homes primarily into investment vehicles has many downsides, perhaps most serious being the current valuation bubble: Australian housing is severely overpriced, leaving many households overextended and exposed, and also squeezing the rental market. If capital gain is the main thing that you care about then that is what you’ll get – at the expense of everything else. We need to change, and we need to change the system. 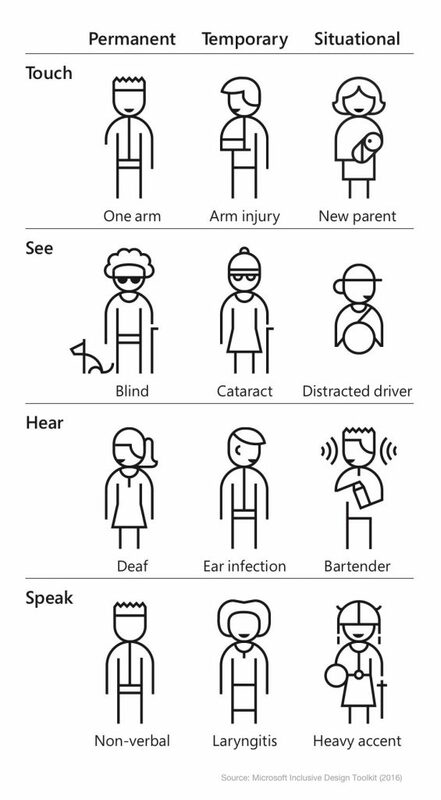 I hope that the above examples have illustrated some of the differences between real needs and mere wants, as well as the shades of grey and some of the complexities in discerning between the two. Why is this distinction important? Because in a carbon constrained world we can no longer equate our sense of progress and belonging with satisfying material wants that masquerade as needs. There is just not enough planet left to live like that – not for us, or anyone else. We need to re-imagine our ideal of progress in non-materialistic terms. We need to reverse growth until we have paid off our mammoth carbon debt, and then settle into a low-material existence supported by a new system that is entirely carbon neutral, end to end. As one key part to doing this, we must urgently strive to Want Less. All content copyright © Jussi Pasanen and respective owners, as referenced. This essay was originally written in September 2018 and published in December 2018. Thanks to everyone who reviewed versions of it.